In the early days of the Nineteenth Century, one of the best known characters at Tunstall was Joseph Capper, the Tunstall blacksmith. It is quite possible that to the majority of Primitive Methodists this is an unknown name, and a short sketch of his career may therefore be acceptable to the readers of the ALDERSGATE, for we may legitimately be proud of such heroic sons as he. Joseph Capper was born near Nantwich, Cheshire, about the year 1788, but in early life removed to Tunstall, “and was destined to make it famous in a famous crisis in his country’s history.” He learned and followed the profession of blacksmith, becoming a proficient craftsman of scrupulous exactitude. His good workmanship secured him the patronage of the Messrs. Kinnersleys, great landowners in the district; and for them he worked the whole of his life. His smithy stood at what is now the corner of the Market Square, and immediately behind it was “old Jebb’s crate shop.” The blacksmith was a stout, strongly-built man, with a round, placid face, of swarthy complexion and dark hair; “a sort of saintly looking John Bull, rather than of the Boniface type.” Rev. Charles Shaw, who knew him intimately, says, “on Sundays he wore a white cravat, such as was worn by the early Methodist preachers.” From early morn to late at e’en the ring of his anvil could be distinctly heard, for he loved his work and prided himself in his proficiency. It is said that he was the best shoeing-smith for miles around, and after shoeing a horse he would stand in the doorway of the forge, and watch the movements of the animal down the street to see how it stepped. Around the smithy were several taverns, but they had no attractions for the blacksmith. The ring of the anvil gave sweeter music than the strains of the fiddle in the public tap-room. Sometimes the frequenters of “The Lamb” would bring their grog outside, and drink it as they were seated on a bench fixed under one of the trees growing near the door of the public house. At such times they would often call to Capper working at his forge, to join them, but to all such invitations he would simply shake his head and continue his work. If we follow the blacksmith to his home we shall see that he lived in a thatched cottage near the smithy. When we enter we find a cosy home, well and neatly furnished. In one corner of the front room a few books are placed, and in the other a low round stand on which rests a large family Bible. The walls of the cottage are cleanly white-washed and decorated with paper prints of the first Primitive Methodist preachers. There were not many pictures on cottage walls in those days, and the best of them were such as petty dealers now use for wrapping their wares. Books were very rare, and those who could obtain them were unable to read, and therefore compulsorily remained in ignorance. Joseph Capper had but little schooling, but in some way he had picked up a smattering of learning; and was able to read his Bible, the sole lesson-book of so many poor people in that day. He loved its storied pages, its sacred counsels, and its revelation of Divine love. He lingered over the Book until the fire of its teaching burned in his soul; its imagery inspired his imagination, and its broad conceptions of liberty created in him an intense hatred against oppression in any form. Whatever he was, as man and citizen, as patriot and Christian, he was made so by the teachings of the Bible. His ordinary speech got its quaintness and unction and force from its pages. Its phrases became his daily speech, and its figures his familiar illustrations. He was a Bible-made man in every function and activity of his life. It spoke to him other lessons than were taught in the churches; it gave him a clarion call to battle against the ignorance, prejudice, and numberless evils which afflicted his fellows. The passing of the Reform Bill of ’32 with its subsequent elections was followed by a short period of commercial prosperity; but after the few years of revival things changed for the worse, and the slumbering elements of discontent broke out afresh, and societies sprung into existence, with all kinds of proposals for remedying the social disorders. Amongst others were the Chartists with their two sections, called “Moral” and “Physical Force” Chartists. The six heads of the Charter made very clear the demands of the unenfranchised people. The heads were all political, not social, as the “Labour Party” now demands. The principles of the Charter Capper warmly espoused, though he always strongly disapproved of the advocacy of the Physical Force Section. Still he attended their meetings and his presence was hailed as the guarantee that the audience would have a “good time.” His broad masculine face, full of kindness and wit, his biting satire, and his speech crowded with imagery, with its short epigrammatic sentences in the vernacular, convulsed the hearers with laughter. Whenever he rose to speak the cry was, “Old Capper’s going to talk, now for fun.” It was his stinging satire that made him so bitterly hated and intensely dreaded by his opponents. Especially was he obnoxious when dealing with the State Church Question; and he would invariably take the opportunity afforded by the platform of making his views known on the subject. But a personal grievance to some degree explains his conduct in this respect. Mr. Shaw tells us that when the new Church at Tunstall was built, in 1832, Joseph Capper was engaged to furnish the iron-work for the steeple, but for this particular work he was not fully paid until 1843. This was to him a settled grievance, to which he gave such prominence in his speeches that Capper and the spars of Tunstall steeple became synonymous. By this means he converted a section of the people into his enemies, and when the opportunity came, with the Chartist troubles, they availed themselves of it to the full. Capper attended this meeting, and urged the people resolutely but peaceably, to seek their rights. This meeting was followed by a fearful riot. Although, during that terrible week, Capper was quietly at home working at his forge, the riotous proceedings afforded a pretext for his arrest. It was easy in a tumult and riot such as this, to confound a man like Capper with those who openly and wickedly broke the law. But no word of his had been meant to awaken a guilty passion. On Sunday evening, August 21st, he had attended the two services at Jubilee Chapel, Tunstall, and at the close of the evening service he wended his way to his little cottage in Piccadilly Street, where in the soft evening light he had gathered his family to join in the usual family worship. That Sunday evening’s devotion recalled in its peaceable and holy elements “The Cotter’s Saturday Night.” But the scene was soon changed, for four men burst into the house. “Well, gentlemen, what is your will? ” asked Capper, “You are the man we want, Joseph Capper,” said the constable, and he was rudely seized by two of the men. The son immediately sprang to his feet, and with one swinging blow knocked the constable to the floor. Perhaps it was an unwise thing to do, but it may be excused under such an exasperation. Had not the father interposed, the others would probably have followed their companion in tribulation, but at his request the son restrained his hand, and the old man quietly surrendered. He was handcuffed and marched off to Newcastle-under-Lyme. As he turned the corner into High Street, he cast one longing look at his old smithy, and then proceeded on his journey. Great excitement prevailed as he was led along the road, and large numbers followed him out of Tunstall, deeply regretting the arrest and sympathising with him in his misfortune. Next morning he was taken before the magistrates, charged with conspiracy, sedition, and riot, and committed for trial, but admitted to bail. He was brought to the Stafford Assizes in October, 1842, and of course with the prevailing sentiment that some signal retribution must be inflicted upon every man who had been at the front in that time of agitation, however noble his endeavours to guide the Chartist movement to true patriotic issues, a verdict of guilty was returned, followed by a sentence of two years imprisonment. But the next year, in company with Thomas Cooper, William Ellis, and John Richards, he was again tried for conspiracy. He was now sixty-five years of age. On each occasion he pleaded his own cause. A few sentences from his speech will give an idea of his defence, which created a strong feeling of compassion, and moved many in the court to tears. He “did not deny that he might have preached from the text, ‘To your tents, ‘O Israel,’ but he had treated the matter scripturally and not as stated by the witnesses. “The witness, Smallwood, said he had talked of ‘arms,’ but the only arms that he had referred to were arms of flesh and blood – the strong arms of England that tilled the ground, that wove our clothes, and the finer fabrics that clothed the ladies. It was the strong arms of Englishmen that built our great ships which ruled the sea, and excited the envy and admiration of the World. It was the strong arms of Englishmen that had reared all our noble buildings throughout the country. The arms he had spoken of were flesh and blood, not steel and iron. With respect to his opinion of a reform in Parliament – although he had a vote himself and two tenants who had – yet he thought it was wrong that men had not votes instead of houses. He thought these things wanted improvement. He was getting old, but he wanted to leave the world more happy than he found it. He was not any enemy to the Church, but he said that there were many things preached by its ministers contrary to the pattern set by the Saviour. Because he said ‘Woe unto those who take away the rights of the poor,’ he was called a disturber of the peace, and a troublesome man. If the preaching of the Word made him so, then he would admit that he was a troublesome man. His object had been, by God’s help, to raise the poor from the slough of despond, and it was for these things that he was confined in a dungeon.” The verdict of guilty at the second trial was accompanied by a recommendation to mercy which had the effect of giving no addition to the sentence passed at the earlier trial, and therefore the result of the second hearing was a virtual acquittal. At the expiration of the two years he came out of prison with shattered health and ruined constitution. A few of his friends met him at Stafford, and when he reached the pottery towns he received quite an ovation, and crowds accompanied him to his cottage. His fellows sought in every way to make him feel their assurance of his innocence; but what a poor compensation for the cruel wrong which had been inflicted upon him. Mr. Shaw says: “A purer and more loyal patriot did not live in the Queen’s realms than ‘Old Capper.’ A more God-fearing and man-loving man could not he found in the whole area of the British dominions. Yet this venerable man was taken from his peaceful home and quiet industry as if he were a murderous villain. It was such conduct as this, next to the prevailing want of the people, which made them so fiercely disaffected.” Two years in Stafford prison was the return his country gave for the efforts he made to serve his fellows, and remove the stumbling-blocks out of their paths. The poor old man felt that his aim in life was frustrated, and the imprisonment had crushed his spirit. His few remaining years were spent in the town he loved so dearly, and for which he had suffered so much; and as the cruel feeling, which had goaded the authorities to his arrest subsided, he came to receive the homage and reverence of those who had hounded him to prison. In the eventide of life, when the tabernacle grew so feeble that he was compelled to absent himself from his loved smithy, when his steps became tremulous and his breathing short, he heard the voice of his King bidding him put off the armour and rest from his labours; and on a winter’s morning in January, 1860, he responded to the call, and his body was laid to rest in the churchyard of Tunstall, where political and ecclesiastical differences would no more disturb the spirit of the old warrior. In the churchyard stands a neat stone at the head of his grave which was erected to the father’s memory by the son, who a short time since returned from the United States. Joseph was baptised on 4 May 1788 at Tarporley, Cheshire. His parents were John Capper and Mary. 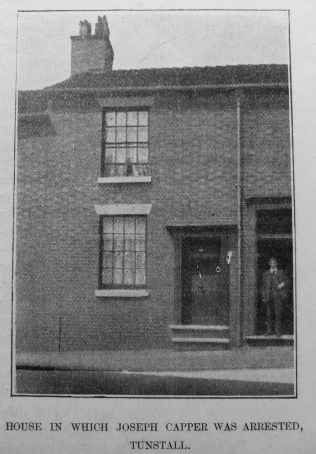 The census return for 1851 gives his birth place as Bunbury, Cheshire. Joseph married Sarah Lloyd (abt1781-1859) on 25 October 1807 at St Oswald, Chester. Census returns identify two children. 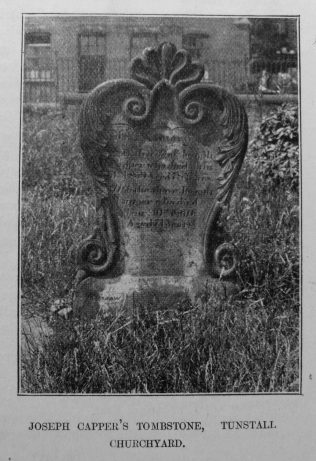 Joseph died on 10 January 1860 at Tunstall, Staffordshire. 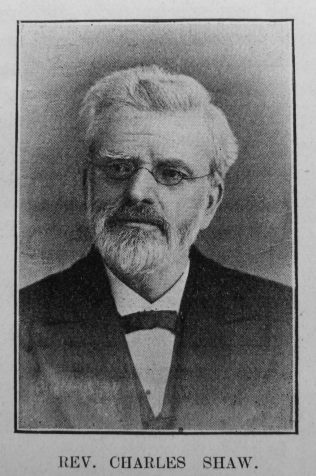 Note: Charles Shaw (1832-1906) was potter and Methodist New Connexion Minister, born in Tunstall.